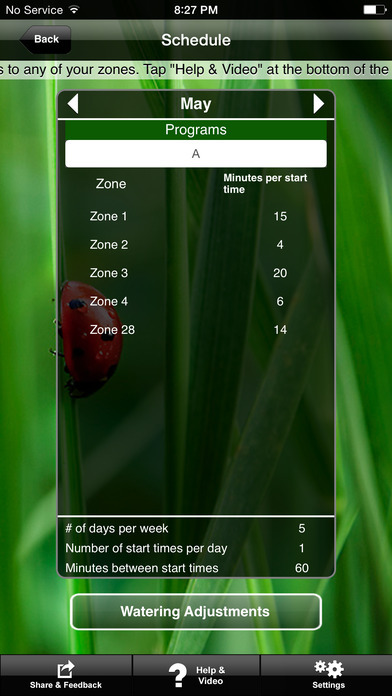 Sprinkler Times is an easy to use irrigation scheduling application that takes the mystery out of trying to program your sprinkler timer (controller). Sprinkler Times was created by professional irrigation managers to improve irrigation accuracy, water conservation, and plant health. By answering basic questions about your yard, Sprinkler Times will provide a schedule for you to program into your existing sprinkler timer. On screen scrolling ticker tape & extensive help videos make this simple to water like a Pro! Sprinkler Times uses your unique information to create a custom watering schedule to conserve water and save you money! The Sprinkler Times App makes saving money, water, and plants easy. Outdoor watering accounts for more than 60% of most homeowner’s water use, yet many people are unknowingly overwatering their lawns by more than 50%. Not knowing how to properly set your sprinkler timer is literally like throwing money down the drain. Sprinkler Times can save you hundreds on your water bill every year, while helping you go Green by saving water. Your Sprinkler Times purchase of $2.99 will include one timer program with up to 32 customizable watering zones. Your timer subscription will last for one year. Smarter watering means less waste, healthier plants and lawn, and huge savings for you. 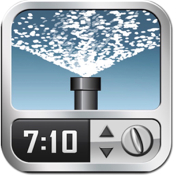 Sprinkler Times - it’s the app that pays you back. It’s simple: The Sprinkler Times app uses localized scientific data to save you as much as hundreds of dollars a year in needless overwatering, while keeping landscapes and the environment healthy. Sprinkler Times uses the science of evapotranspiration -- regionally-based climate information and scientific soil and plant data -- to determine the best possible automated sprinkler settings required for healthy lawns and landscapes. All you have to do is answer a few questions about the unique elements of your yard and Sprinkler Times will take care of the rest. Garden Apps, the company behind the Sprinkler Times App, has been using this data successfully for decades to eliminate overwatering, leading to healthier landscapes and household savings of hundreds of dollars annually. - Designed by landscaping and irrigation water experts to reduce water usage and save you money.